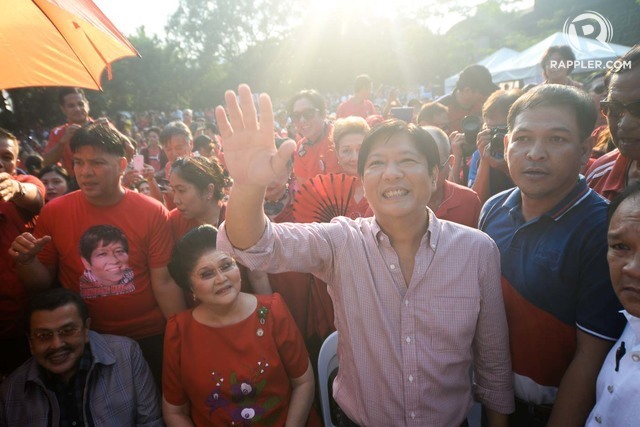 MANILA – Vice-presidential aspirant and Senator Ferdinand ‘Bongbong’ Marcos Jr. on Thursday said bringing closure to the injustices committed during the reign of his father, the late strongman Ferdinand Marcos, is out of his hands. Marcos said he would apologize if he did something wrong. ”Naiintindihan ko na people are looking for closure, but to provide that closure is not within my hands. Wala sa akin yun eh, hindi ko kayang ibigay sa iyo yun eh,” he said. The younger Marcos has been criticized for not apologizing on behalf of his father. READ: Bongbong on Marcos era: What am I to say sorry for? Marcos acknowledged that human rights violations were indeed committed during his father’s time, but he said whether his father made it a policy to commit atrocities is a different matter. He noted that during his father’s time, the Philippine government was fighting the secessionist movement in the south and the communist uprising in the countryside. Thus, humans rights abuses could not have been avoided, he said. ”Iyung mga napagkatiwalaan na di dapat pagkatiwalaan, di nila ipinatupad ang mga bagay na gagawin nila…Mayroon talagang nag-abuso, iyung mga sundalong may ginulpi, nangyayari iyon,” he said. The Marcos family has long been dogged by accusations the dictator oversaw massive human rights abuses and plundered billions of dollars from state coffers until a famous “people power” revolt toppled him from power in 1986. But after the Marcos patriarch died in exile in Hawaii in 1989, the family returned to the country in 1991 and began a successful political comeback, culminating in Bongbong Marcos getting elected to the Senate in 2010. During the interview, Marcos again emphasized his message that the Filipino people should “move on from the past” so that the country can move forward. he TV ad shows different people, including a swimmer with one leg, and a fisherman who lost his boat, rising above their limitations or hardship. “Tayong lahat, kahit nahirapan tayo sa nakaraan, kahit tayo ay minalas sa nakaraan, huwag nating pababayaan na hanggang doon na lang tayo. Ipagpatuloy pa rin natin ang pagsisikap,” Marcos explained. “Ang sinasabi ko, lahat ng tao may pinagdaanan na kahirapan. May kasabihan nga: ‘Into every life a little rain must fall.’ Pero huwag nating pababayaan na yun na ang, hanggang doon na lang tayo,” he said. Bongbong’s past has not stopped his rise in pre-election surveys. In the latest Social Weather Stations (SWS) January 2016 survey, Marcos was statistically tied with consistent front runner, Senator Francis Escudero. Escudero got 28% voter support in the latest survey, down from 30% in December. On the other hand, Marcos’ numbers improved from 19% in December 2015 to 25% in January, or an uptick of six percentage points. Liberal Party vice-presidential bet Leni Robredo is third in the race with 17%, down from 19% in December.